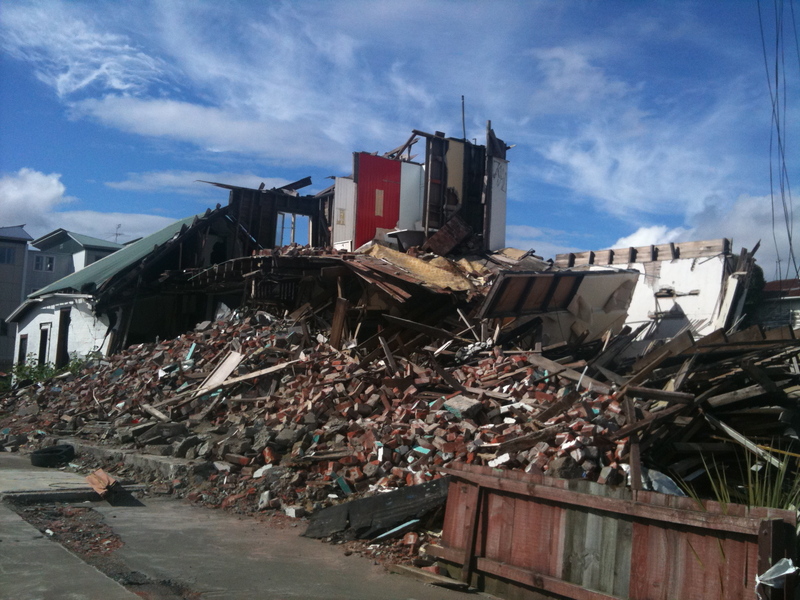 Blog – JC on Walkabout 2011 to date…..
Christ – and all His Churches gone! I realise that almost every Blog I write starts with a disclaimer about what time has elapsed since the last, and this is no different. 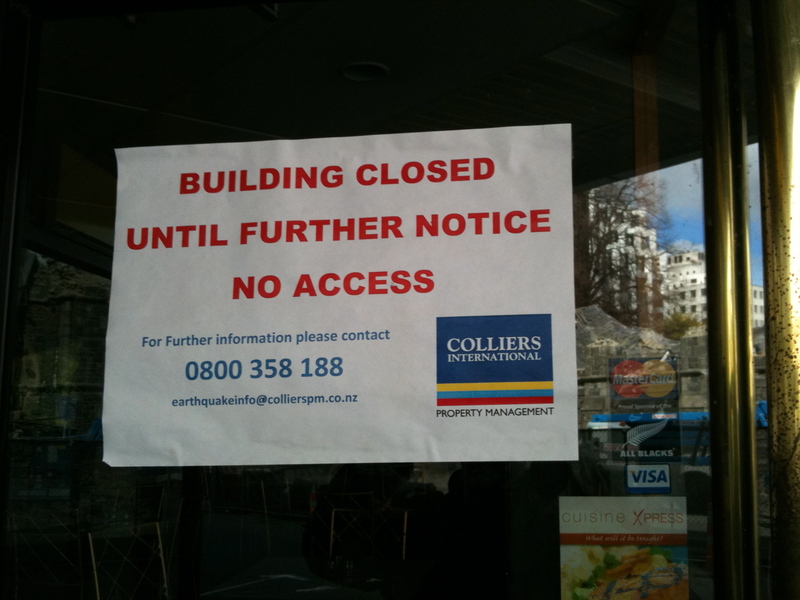 My excuse in this case being that I was left in such shock after my brief visits to Christchurch that I didn’t know what point there was in writing about it……….. Still, several weeks later and I wanted to record what I felt (and photographed) at that time – so feel free to skip what will be a rather lower-key, probably sad reminiscence. 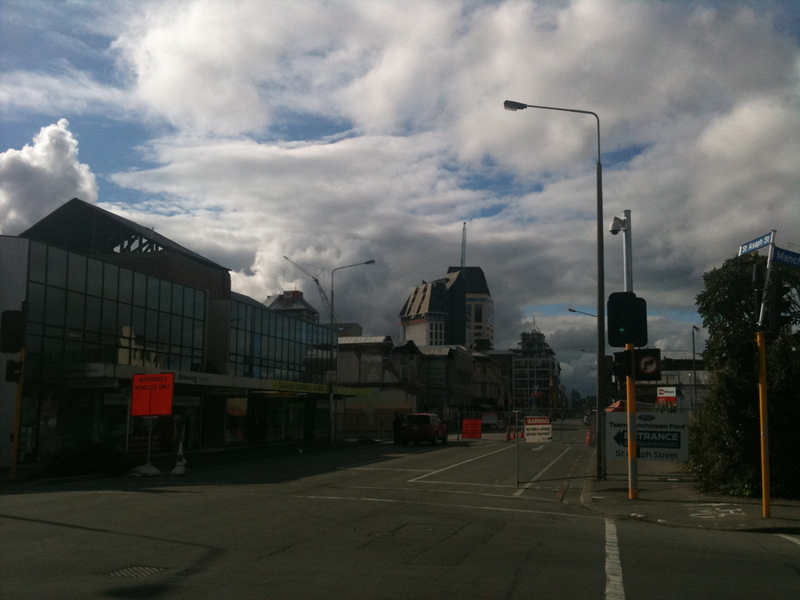 I arrived in Christchurch late at night / early morning on my birthday – 13 October – and spent a pretty uncomfortable night on airport bench seats till the coffee store opened about 5am and the first bus into the City departed at around 6. I was purely passing through, to make a connection with a coach going down south (see my Post on Dunedin) so saw little of the City itself. I remember being surprised when the airport bus dropped me next to a park and the office for the coach company was a portacabin / almost a ship’s container. A little further down the street, an old bus seemed to be the ticket office for all the local buses (and there were many). I didn’t realise (at that time) that the whole of the transport infrastructure had been re-scheduled, due to the closure of the city centre and, with it, closure of the bus and coach depots – and much more besides. 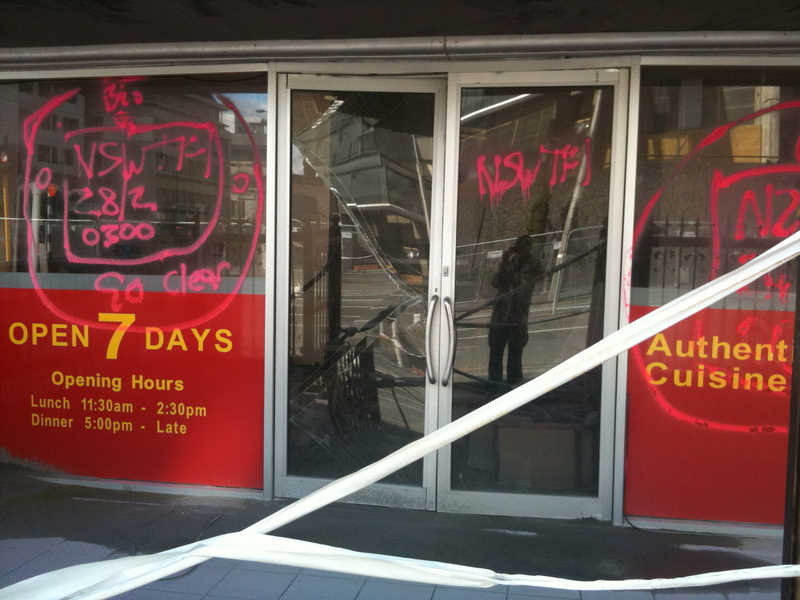 It wasn’t till I returned a few days later – and had a day in Christchurch – that I fully absorbed the enormity of the two earthquakes that hit the city in the previous few months; the most recent (last February) causing the closure of the ENTIRE city centre………. Imagine (say) Cardiff, or Bristol, or Sheffield – all cities with similar populations of Christchurch – around 450K. So far bigger than, say, Canterbury, Cambridge or Bath in populations terms. To give an idea of the size of the place. 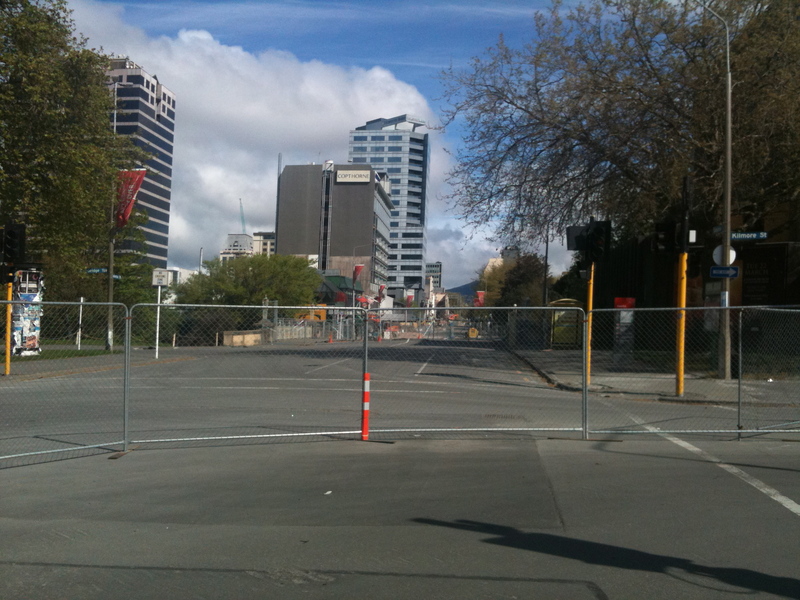 Then imagine – if you will – putting a fence around the very centre of the city/town and simply closing everything off! As far as I could decipher, the marks on buildings indicate which International team had checked the building, when and what the result was. So many of them seemed OK – until you noticed that at ground level – right where the foundations meet the pavement or street – the whole structure has dropped. 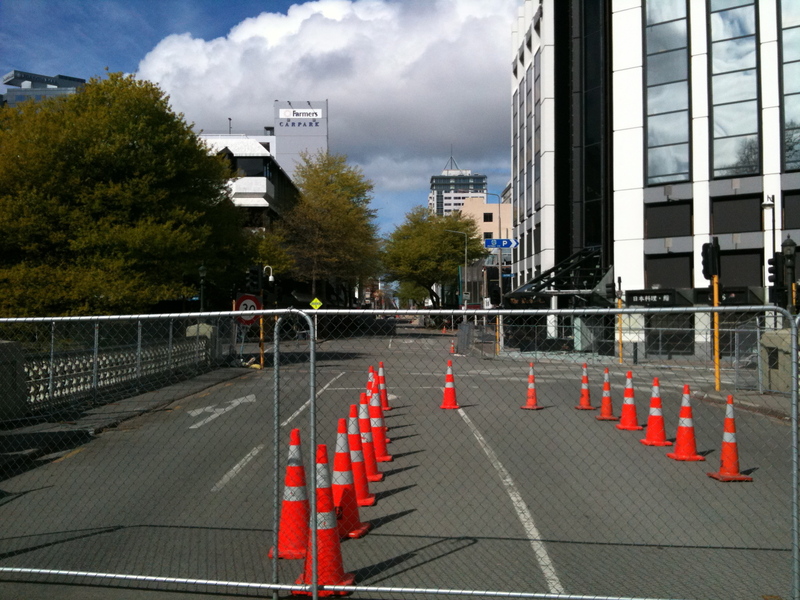 They even use that term around the City centre – you can’t enter the “Drop Zone”. 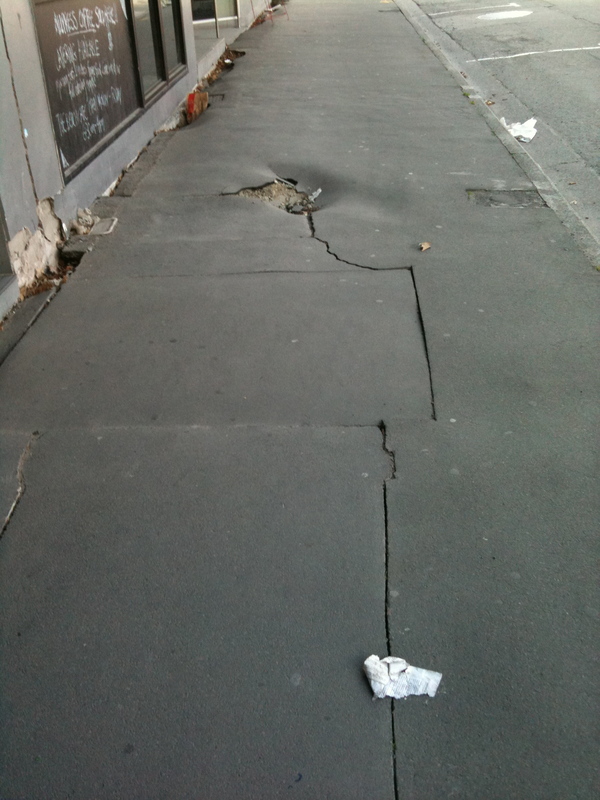 Which is why it is taking so long to restructure and rebuild : when the earthquake hit, whole sections of the ground simply dropped : fell in (sometimes by several feet) taking all services and utilities down with it……..look at the way this pavement is humped and where the building has sunk…. And one of the saddest sights – not just in and around the city centre – were the Churches. 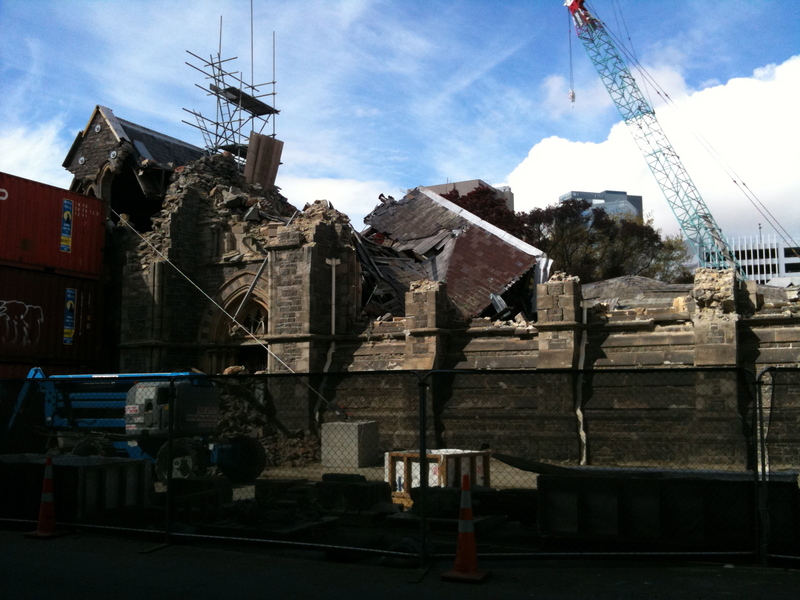 Most of them (I suppose) Victorian and therefore hardly built to withstand earthquakes, with the following result…. I must have seen 6 or 7 churches like this around the city – and two or three empty (cleared) sites with a Notice saying where the church services were being held now that the church on the site I was looking at no longer existed. The only way I can describe the experience is to ask you to imagine arriving at your local city – whereveryou (my reader) happens to live. As you approach through the suburbs, roads are simply shut off with No Entry signs. Garden walls – especially old brick ones – every few hundred feet are shored up with L-shaped timbers, since clearly they would collapse without support. A pair of semi-detached houses stands – one unmarked and ordinary, it’s next-door neighbour shored up much like the walls are. The sight is simply bizarre. 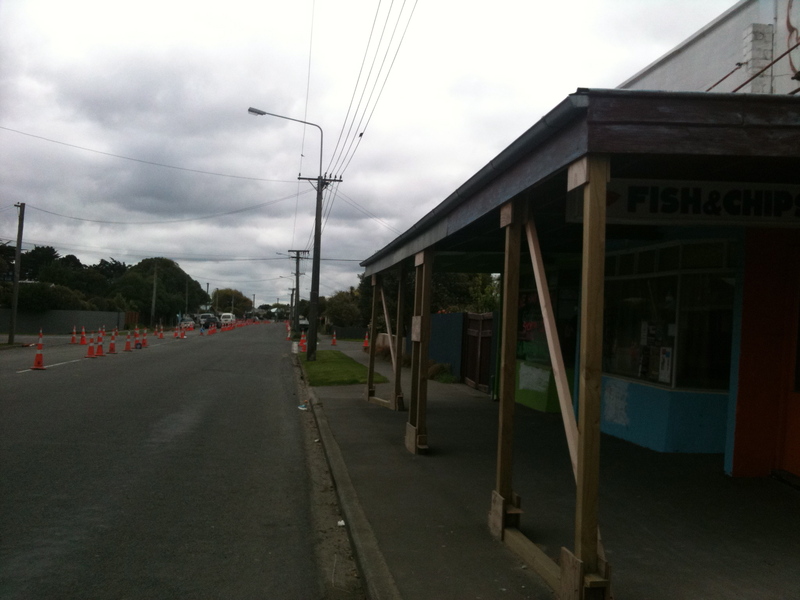 Bits of gable roofs missing, motels rickety and shut down. And then consider ALL the shopping centre being closed – no buses, no taxis, no department stores or supermarkets, no hotels, no cinema or theatre, no clubs and pubs. All shut – save those in the outlying suburbs – most of which (at least on the landward side) escaped the worst of the shocks. Even the bus I took from the City to the seaside made several diversions around rounds and areas where I could clearly see “drop zones” on roads, and pipes with water/gas services being restored. Yet even here – as I wandered a little, trying to find the diverted bus-route back, this little row of local shops had its own story to tell, 3 or 4 miles from the city centre at least. right next to the odd collection of huts and sheds that comprised the central bus “hub” was a brand new trailer selling home made cakes, healthy snacks, the best coffee I had had in months and two ladies serving who explained that their cafe in the city was out of bounds so they had created this unit to service people travelling the buses and so that their name (brand) wouldn’t be forgotten. Around the corner, in the city’s largest park, a local lobby group had set up a tented camp and was offering places to stay for people travelling through and also dispensing information on how to be part of the process of re-building Christchurch for the local community, along with help yourself lunches. 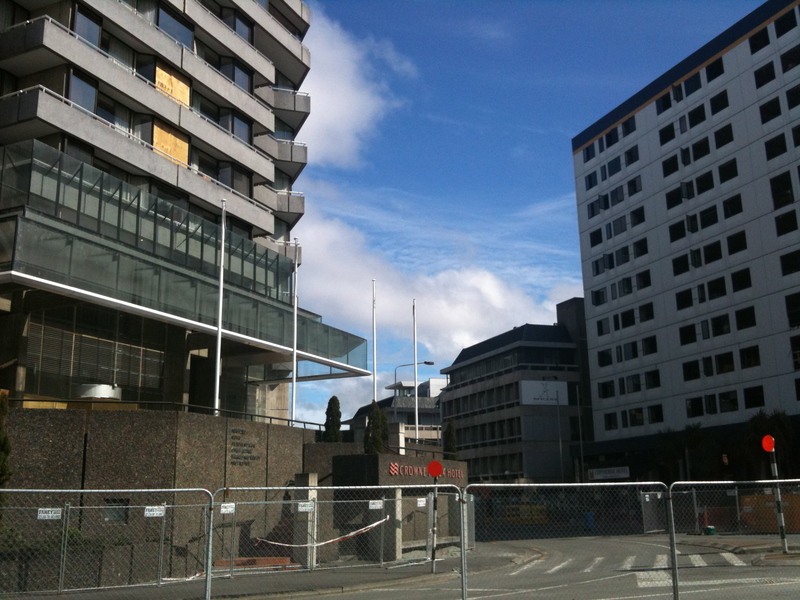 Though I left Christchurch somewhat subdued by it all, I left without doubt that it would rise again, but maybe with less desire to build high-rise hotels and offices, whether earthquake-proof or not! 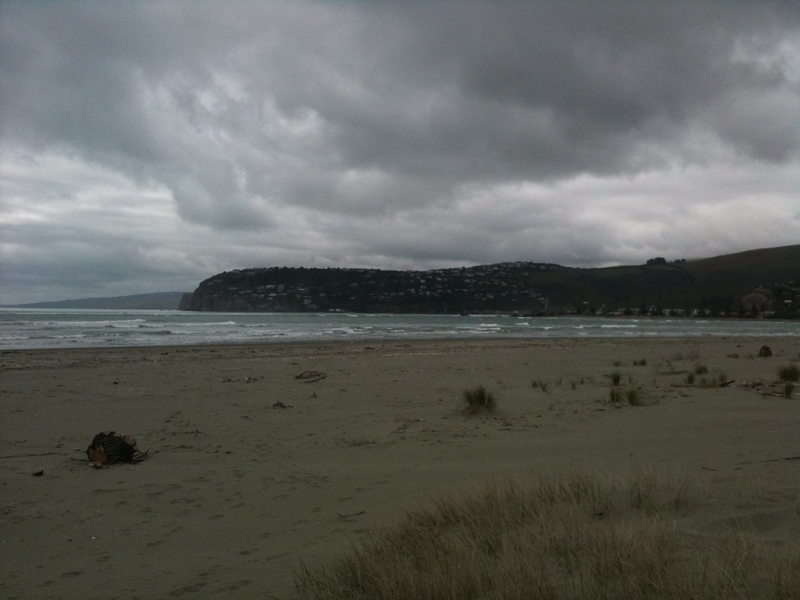 This entry was posted in Earthquake, New Zealnd, Poetry, Travel. Bookmark the permalink. Great post today thanks. I really enjoyed it very much. Love to write? Join us today! Stumbled across your blog while looking for photos for a presentation I am doing for work.